Whatsapp (English only): 392 032 7955. We only use the best carriers. More than 100,000 articles available on our website. Give your softail the nostalgic look of real duals. 2 1/8 "220 ° full-insurance headpipe heat shield heat, 2 1/2" slip-on shieldsmake the virtually waterproof blue system. The uncomfortable gives the performance and you expect with standard awning base baffles. Enhance the nostalgic look of a softail springer or any other softail model. Corresponding function straight cutting tips machined in the mass. Flat surface mounting panel for 12mm oxygen sensors now introduced through softail / dyna model lines of 12-15; Mounting position sensor faces deeper into the exhaust streams, providing improved data feedback to the ecm. Category: 4-stroke color: chrome configuration 1: true dual tip style: straight-cut finish: chrome material: steel model: softail duals Units: pair form: straight specific application: yes heat protection: yes approval information: not for street legal use style: full system type: exhaust system. Flhrse5 1800 abs road king cvo. Flhrse5 1800 abs road king cvo 110th anniversary. Flhrse6 1800 abs road king cvo. Flhtcuse6 1800 abs electra glide ultra classic cvo. Flhtcuse8 1800 abs electra glide ultra classic cvo. Flhtcuse8 1800 abs electra glide ultra classic cvo 110th anniversary. Flhtkse 1800 abs electra ultra glide limited cvo. Flhxs 1690 abs street glide special. Flhxse3 1800 abs street glide cvo. Flstc 1690 abs heritage softail classic. Flstc 1690 abs heritage softail classic 110th anniversary. Flstc 1690 heritage softail classic. Flstf 1690 fat boy abs. Flstfb 1690 fat boy lo abs. 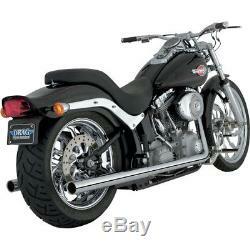 Flstfb 1690 fat boy abs lo 110th anniversary. Flstfb 1690 abs fat boy special. Flstfb 1690 fat boy special abs 110th anniversary. Flstfb 1690 fat boy lo. Flstn 1690 abs softail deluxe. Flstnse 1690 abs softail deluxe cvo. Flstse3 1800 abs softail convertible cvo. Fltrxse 1800 abs road glide custom cvo. Fltrxse2 1800 abs road glide custom cvo. Fltrxse2 1800 abs road glide custom cvo 110th anniversary. Fxsbse 1800 abs breakout cvo. Fxsbse2 1800 abs breakout cvo. We use the best national and international mail, after a careful and rigorous selection on the service offered. Orders are not shipped immediately, but after a maximum of 2 working days after receipt of payment. We send at a time when the package leaves our warehouse, a detailed communication on how to track the package. These times are standard for our store and can under no circumstances be modified or accelerated. As professional sellers guarantee the right of withdrawal within 14 days from the date of delivery of the item. Returned items must be sent intact, exactly as they are from each package have been received and complete, untested or used in any way. Our technicians check each receipt and evaluate its condition according to the conditions. If the return does not comply with the described requirements the return can not be refundable. Click the button to receive information on new items and discounts. Sp custom shop is the site where you will find all the accessories for your bike. Our customer service is always ready to support you for any doubt, request or problem. We are always at your disposal. The item "vance & hines softail duals harley davidson softail 2012-2014" is on sale since Wednesday, June 7, 2017. It belongs to the category "auto, motorcycle parts, accessories \ motorcycle \ spare parts \ exhaust systems \ systems complete exhaust ". The seller is "justsporty" and is located in milano. This item can be shipped to the following country: europe.